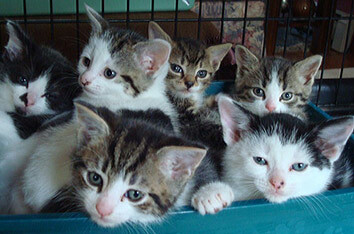 If kittens are available on adoption days, a notice will be posted - on OUR FACEBOOK PAGE the day before adoptions. 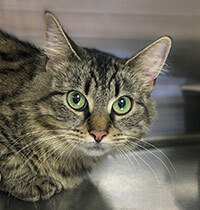 PEOPLE FOR CATS (PFC) is an all-volunteer, non-profit organization that operates a no-kill shelter serving the towns of Falmouth, Bourne, and Mashpee. PFC is dedicated to: finding good homes for adoptable stray and surrendered cats and kittens, reducing the stray and feral population through spaying and neutering, and educating the public about responsible cat care and ownership. Occasionally, People for Cats makes a big difference in the life of an entire family of cats. That was true of a cat named Kahlua and her brood. While this story has a happy ending it might easily have turned out very differently. One morning in late May a volunteer found a box of four kittens that had been left outside the PFC shelter the evening before. The kittens were approximately six weeks old and were promptly brought to a foster home for extra care and socialization. 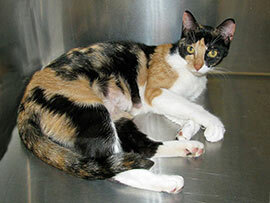 Then throughout the day people kept reporting seeing a pretty calico cat hanging around the shelter. Finally, as evening fell, the cat lay on the stairs where the box had been and allowed one of our volunteers to pick her up. When this cutie was examined, it was clear that she was most likely the mother of the abandoned kittens. The family was quickly reunited at the foster home and Kahlua was able to finish raising her amazingly cute kittens: Kahn, Kato, Kohl and Keema. Actually, they were so cute that the foster mother ended up adopting two of them herself. 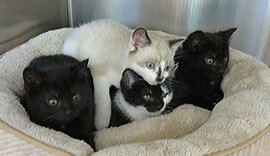 Once the kittens had all been adopted, Kahlua was spayed and brought in to the shelter for adoption. She was such a sweetheart that she promptly found a fur-ever home of her very own. PFC was able to save this entire family, as well as many other cats, thanks to the generous donations of people like you. Thank you!